I've received many comments and requests since I've posted about getting a tattoo from others who also have tattoos. They've asked that I share about mine and then give them an opportunity to share about their's. Thankfully much of the stigma that has previously been associated with tattoos is falling away. Hopefully this post will be an encouragement to those who have not thought about it to consider that tattoos are like any other asthetic addition to one (i.e. makeup, earrings, etc.) albeit a more permanent addition. I got my tattoo as a birthday present on my 25th birthday. I had wanted one for sometime and had carefully decided what I wanted it to look like. I wanted one that was simple, yet would also make a significant statement. So, I chose the Icthus. When one thinks about the Icthus and that it was THE symbol of the early, persecuted church and that it was the one physical symbol that identified them as a believer, you can't help but be thankful for it. 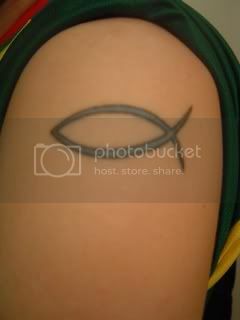 I wanted the Icthus on my arm as a physical reminder of my affiliation with Christ. I've included a picture of it for you to see.